Actually, Clean & Simple does take me a bit of extra time, because it’s not really ‘my style’. This time I think I did pretty well! 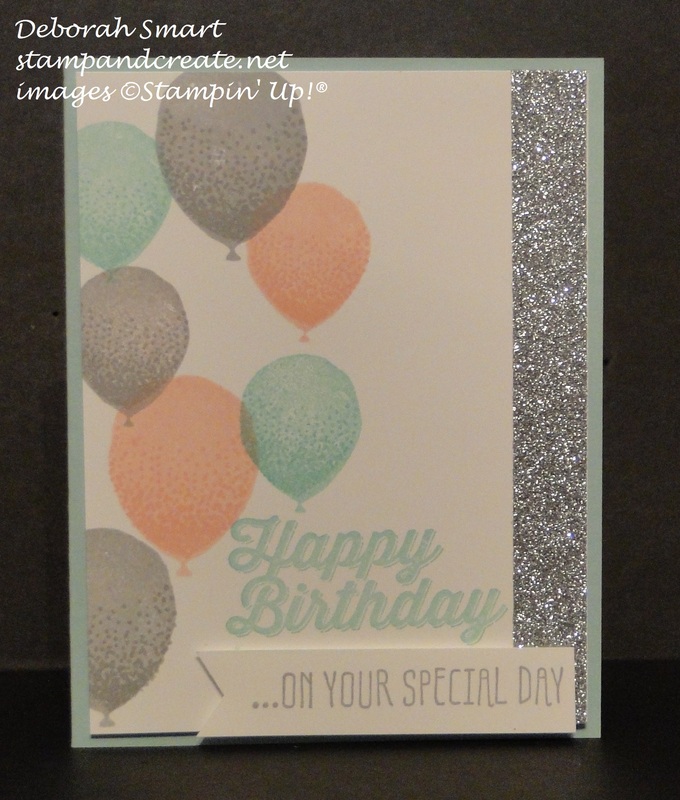 In this card I’ve combined the Balloon Celebrations set from the Occasions catalogue with a couple of Sale-A-Bration items – the Metallic Glitter Tape and the Perfect Pairings stamp set. I have to admit – I just love the Balloon Celebrations set! I’ve certainly been getting my money’s worth from this set, I’ve been using it a lot! I started with a 4″ x 5 1/4″ panel of Whisper White cardstock, and stamped the small and large balloons in Pool Party, Blushing Bride and Smoky Slate inks. The stippling for the balloons was then stamped in the same colours as the balloons. I like the effect of the balloons floating up the side of the card 🙂 I then stamped the sentiment on the bottom right side in Pool Party ink from the Perfect Pairings stamp set. The sentiment was stamped in Smoky Slate onto a small piece of Whisper White in Smoky Slate ink, and the one end punched using the Banner Triple Punch. I added a strip of the Metallic Glitter Tape in Silver down the right side of the card front, then added the sentiment on top using Stampin’ Dimensionals. The whole card front panel was added to the Pool Party cardstock base using Stampin’ Dimensionals. So there it is – I think I managed to keep it pretty Clean & Simple! 🙂 I’d love to read any comment you’d like to leave – please let me know what you think of my card, and how you’re enjoying the challenges! Is there a particular kind of challenge you like best? If you haven’t already, I hope you’ll head over to the Watercooler Wednesday challenges page and see the fabulous cards the rest of the design team have made. Thanks for spending some time with me today! I hope you’ve found some inspiration for your own stamping. Previous Previous post: Weekly Deals & SAB Countdown! You did a great job on a CAS card, Deborah! I love the added sparkle!